Profiling is an alternative to benchmarking that is often more effective, as it gives you more fine grained measurements for the components of the system you're measuring, thus minimising external influences from consideration. It also gives the relative cost of various components, further discounting external influence. As a consequence of giving more fine grained information for a component, profiling is really just a special case of monitoring and often uses the same infrastructure. As systems become more complex, it's becoming increasingly important to know what monitoring tools are available. By the way, being able to drill down into software components as I'll describe below, is a large advantage that open systems have over closed ones. GNU/Linux profiling and monitoring tools are currently progressing rapidly, and are in some flux, but I'll summarise the readily available utils below. That will display this handy curses interface on basically any hardware platform, which you can use to drill down to the area of interest. See Brendan Gregg's perf examples for a more up to date and detailed exploration of perf's capabilities. Other system wide profiling tools to consider are sysprof and oprofile. It's worth noting that profiling can be problematic on x86_64 at least, due to -fno-omit-frame-pointer being removed to increase performance, and 32 bit fedora at least may be going the same way. One can use perf to profile a particular command too, with a variant of the above, like perf record -g $command, or see Ingo Molnar's example of using perf to analyze the string comparison bottneck in `git gc`. There are other useful userspace tools available though. 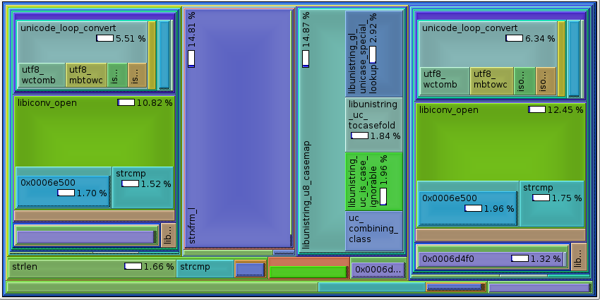 Here is an example profiling ulc_casecoll, where the graphical profile below is generated using the following commands. 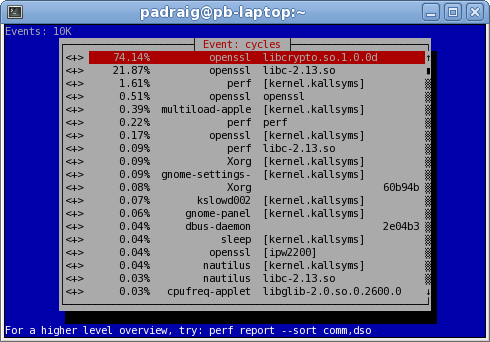 Note kcachegrind is part of the "kdesdk" package on my fedora system, and can be used to read oprofile data (mentioned above) or profile python code too. I've detailed previously how important, efficient use of the memory hierarchy is for performance. Newer CPUs are providing counters to help tune your use of this hierarchy, and the previously mentioned Linux perf tools, expose this well. Unfortunately my pentium-m laptop doesn't expose any cache counters, but the following example from Ingo Molnar, shows how useful this technique can be. Note the large ratio of cache misses. We can see the L1 cache is much more effective.